I have always struggled with the concept of a “Notes” app. What is the definition of a notes app; what information is tracked here? Is this a place to catch all my ideas and outline my future plans? Should I use it as a to-do list aggregator? What about images, websites, sketches? Where do those go? Why switch from Evernote to Apple Notes? Sound familiar? I wasted more time contemplating my options then I ever seemed to spend using any of them. I’ve tried Wunderlist, Evernote and Trello; but until now, I never could seem to commit to any one of them for an extended period of time. They all have their merits, and are all capable apps. Eventually, I decided to use Evernote as my go-to notes app for the last 9-10 months. I would describe my experience as “ok” but I have never been completely happy with the Evernote mobile app. As a result, I still wasn’t completely satisfied with the overall experience, and have been on the lookout for a replacement. I’ve never been very excited about using Apple’s Notes App, except when I needed to generate the occasional quick list. I was excited to see Apple finally breathe some new fresh air into the app with the release of iOS 9, and El Capitan on the Mac. Notes now has so much more to offer including paragraph formatting, checklists & bulleted lists, videos, maps, documents, web links, and pasted graphics. Apple Notes is now an intriguing replacement option–at least for my needs. Open Evernote on your computer. Select the Evernote notes you want to export to Apple Notes–I chose select all to grab all my noters, but you can pick and choose if you’d rather not transfer everything. Open the downloaded file (Export Evernotes notes to Apple Notes.applescript). Watch the files begin to populate in your Notes app. 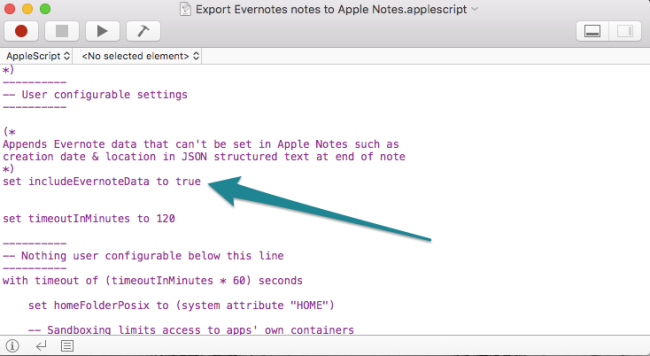 Will your Evernote tags transfer to Apple Notes? If you are like me, and you haven’t been good about tagging your notes for the most part, this isn’t a big deal, since you can’t tag your Apple Notes anyway. However, at the end of each of your transferred notes, Larry’s script pastes text that includes any tags you applied in Evernote. This way you can search for your tags if you had any in Evernote. If you’d like, you can turn off the part of the script that is added to the end of each transferred note simply by changing the word true (below) to false in the script before running it. This is what I did because I hadn’t been tagging my notes in Evernote, and didn’t need the added text. The whole migration took less than 4 minutes to copy my 370+ notes from Evernote to Apple Notes. If you ever decide to go back to Evernote–no worries, all your notes are still there. Just to say a big thank you for posting. I’d come across this script but was always a bit dubious about such things. Your review convinced me to give it a try. Worked a treat. Saved a lot of copying and pasting. Followed through with a tweet to thank Larry too of course.